Looks more expensive than it costs! This futon is beautiful! The navy color is really pretty - almost denim looking. It is a little harder than most, but I find it to be pretty comfortable. And I love that it folds out into a sleeper! The only negative for me was assembly. It was not as easy to put together as other couches/futons and the assembly instructions could definitely be improved. Over all, a great product at a great price! Purchased this for my basement as we were having a hard time finding a regular sofa to make the turn in the stairs. We were very impressed with how it was wrapped and packaged for delivery. Assembly seems easy enough as my husband did it in a short amount of time. This will be used mostly by our kids but we have sat on it and watched a movie and it is firm but definitely not uncomfortable! 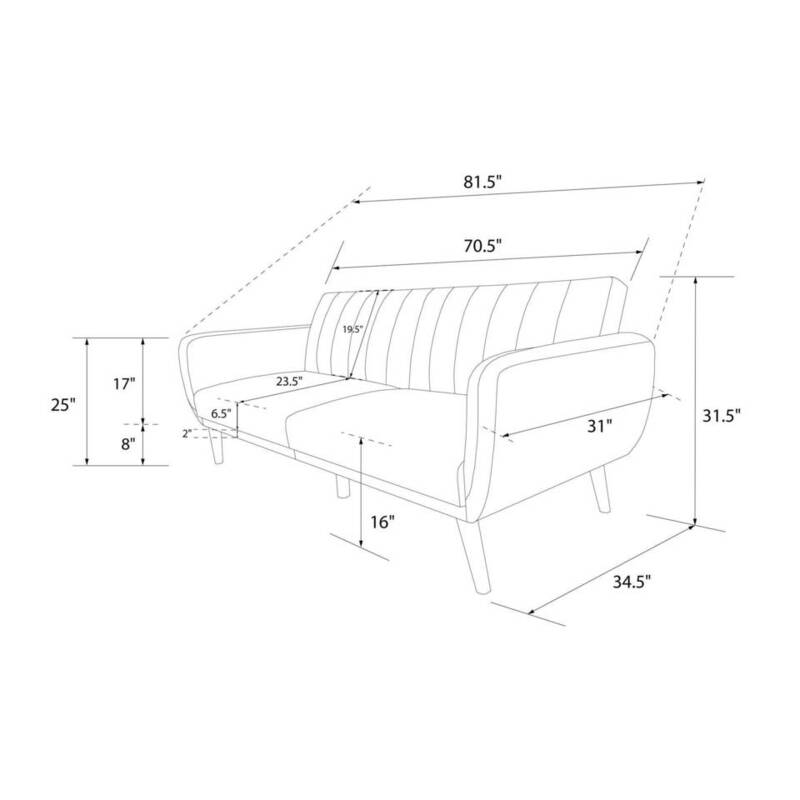 It is a little lower to the ground than a regular sofa but we knew that before purchasing. The fabric is very durable (and a wonderful deep blue color) and the reclining feature on the back seems very well made. We like it so much that we are considering buying one more to make an "L" shape with them and have more room for kids who sleep over! I would consider this a futon, not a sofa. It wouldn't be good in a room it would get a lot of use in. It is better suited for occasional seating and for an overnight guest. We used a foam topper and full size sheets when we had a guest and it slept well. It will sleep one adult or two small children. The fabric is great and a really nice midnight navy color. We are really pleased with it overall. I love the design of this couch. It's durable and easy to clean. And great for guests! Easy to put together and fold down for use, great price point and a stylish piece for our playroom! Very beautiful futon/couch, it's on the firm side but with throw pillows it's comfortable! Will only be using as a couch not folding it into a "bed". Only thing was the side arms the bolts you don't screw in until hand tight because then you cannot add the washers/nut on, at least with ours. Took about 45 minutes to put together. Cute looking. But cushion is kind of firm/hard. We do not sit on this that often, so it works for us. If you want to use often, I think you should buy something more comfortable. Just in case, I bought 3 year warranty, too. It is very reasonable price. It is nice of Walmart, they give the warranty option! Overall, I am happy about my purchase. In the end, it looks nice - but that is it. This futon feels more like a bench with an uneven seating surface. It's almost as if my futon skipped the padding part of the assembly line. Zero padding on the seat surface. You can feel wires on your tush. The back and sides are sufficiently padded. The back is split into two parts that can fold down separately. When lifted into "couch" position they did not line up - one's upright position was about 3" further back and it was very visible. The material feels like cheap thin denim - I don't see it lasting. The fabric was buckled along the bottom due to a poor stapling job in the factory. The bolts supplied to attach the arms to the seated section were not long enough to reach all the way through - so in order to get it "together" the bolts could not be tightened all the way. I'm really upset with the quality of this piece and will be returning it. What size sheets and bedding would fit on this? 2. I would say probably full size, they may be a little big but twin size are to small. 3. Full sized sheets fit our couch. 2. Full sized sheets fit our couch. How tall are the arms when the futon is assembled? 1. Hello, the arms are approximately 17 inches tall, and the height from the floor to the top of the arms is 25 inches when assembled. Thank you.